I love my concrete heart. It is truly beautiful and the sale overall was very easy and shipped quickly. Thank you! Thanks so much for the fast delivery of my beautiful holiday cards. I absolutely love the quality and original artwork! 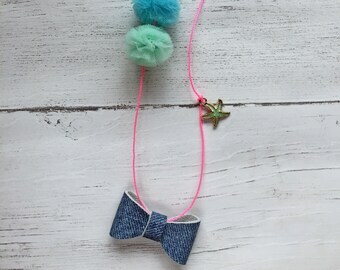 Excited to share the latest additions to my shop: Girls Leather Bow and Tassel Necklaces with Pompons and Enamel Charms. Margaux Bijoux is a jewelry and accessories brand featuring handmade, one-of-a-kind pieces meant to delight the wearer and bring a joyful feel to any style. I primarily work with upcycled and reclaimed leather, as well as sustainable concrete. All Margaux Bijoux items are created by me, Margaux Mays, in my home studio in the near west Chicago suburbs. Earrings crafted from soft suede, delicate concrete hearts hung on a chain, necklace beads shaped from colorful polymer clay and wooden pendants hand-painted with bold designs are just a few of my fun and unique creations. As I am designing a new item or revisiting a cherished favorite, I create each piece as though it’s a gift. Whether it’s a treat for the customer or carefully selected for someone else, my hope is that every Margaux Bijoux purchase is unwrapped with the joy that comes from receiving something special. In a way, gift-giving is how Margaux Bijoux began. I was motivated to launch my Etsy shop after giving away bags, jewelry and other trinkets I crafted for friends and family. Even as a child, I was always making something. I accessorized with handmade hair bows and wore t-shirts I decorated with puff paints. My mother encouraged my creativity. An avid cross-stitcher and seamstress herself, I was amazed at how she transformed simple thread and fabric into elaborate designs and beautiful clothing. Seeing that transformation of ordinary materials into a gorgeous result inspired me to find ways to turn conventional materials into unconventional jewelry. Margaux Bijoux combines a lifetime of creative passion with my desire to work with a range of mediums to produce distinctive, wearable art. As a self-taught artist, my educational background is in marketing and business. My current full-time job is in the digital space, creating and managing online content, which challenges my creativity in a different, but still fulfilling way. I also enjoy helping others discover their own creative talents and regularly host meetups around arts and crafts. For more details on the next meetup, my latest artistic creation and what I’m up to in my daily life, follow me on Instagram @MargauxBijoux and on Facebook @ShopMargauxBijoux. 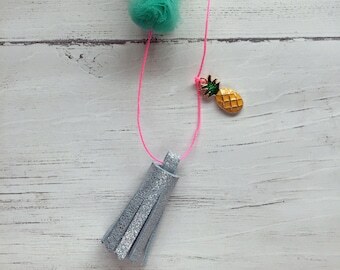 Welcome to the Margaux Bijoux Etsy shop! Here you will find handcrafted jewelry and art. For more information about me, see my profile and my shop policies. Contact me with specific inquiries on custom orders. Items are made to order and are not refundable. I accept major credit cards, debit cards, Etsy Gift Cards and PayPal. Items are shipped to your default PayPal address. Please verify your PayPal ship-to address before submitting payment. Work on your item will only begin once payment is received. Each item is unique and made to order. Please allow up to two days for completion before shipment. If you are located in the Chicago area, items are available for pick up at no charge. Please contact me for details prior to placing your order. Delivery times will vary. Tracking information is provided. Though packages shipped domestically usually arrive sooner, please allow a minimum of seven days after the original date of mailing and contact me to report a non-delivery.